We have a fleet of safe and reliable school horses for you to learn on, from complete beginner schoolmaster horses through to horses who can take you to that next level. Our instructors can also teach you on your own horse or pony. This half hour lesson will be the perfect start before heading to group lessons. Your capabilities will be estimated to ensure you are placed in the correct group lesson. Private lessons are progressive and fun and a great way to improve your skills.30 minute private lessons are highly recommended before commencing a group session. Private lessons can be booked at your convenience from Tuesdays to Saturdays. Group lessons are one hour. A half hour private lesson is recommended before so as to bring the riding standards to equal levels. Groups are limited to six to maximise the hour for the students benefit. Lesson plans are determined by the group skill level – this generally consists of dressage, showjumping and cross country training. Groups can be made up from friends and colleagues, and the lessons can be organised to suit your requirements. Birthday parties, work functions and the like can be facilitated upon request. Jump club is designed for our more intermediate riders who show a real passion for Jumping. Each week will be a different training exercise, taking into consideration showjumping competitions, rules and regulations.At the end of the term culmination in an in-house competition. This is a fast paced grouped and only suitable for riders who can walk, trot and canter confidently, put their bridles on and are capable of mounting unassisted. There are two sessions allocated for the Saturday School riders, one starting from 9:00am and finishing at 12 noon and the other starts at 1:00pm and concludes at 4:00pm. Full Day sessions are also offered which start a 9am and finish at 4pm. The session consists of an hour of group riding, an hour of theory and general horsemanship. Come and ride in one of our many arenas for a 1 hour group lesson followed by a light lunch and a glass of wine. Groups can be made up of friends, work colleagues or family, groups can be up to a maximum of 6 riders. Groups are by appointment at your convenience. Tuesday, Wednesday and Thursday evenings at 4:30pm sessions, come and ride in our flood lit arena or indoor arena and join in a fun filled session aimed at 6-16 year olds. 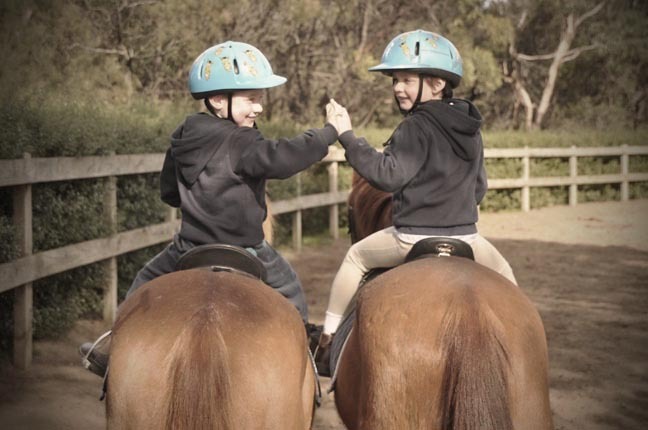 Learn about the horses care in a safe and fun environment and enjoy a 1 hour group riding lesson followed by an half hour focuses on horsemanship and practical skills. The disclaimer form is required to be completed fo first time clients. Either email the completed form to manager@wallingtonpark.com or fax to 5250 1421.